NEW YORK—While many people may not know what they have until it’s gone—to paraphrase a song by Joni Mitchell—there are others who know exactly what they’ve got and how lucky they are to have it. In these cases, a loss can be much more terrible when it happens. 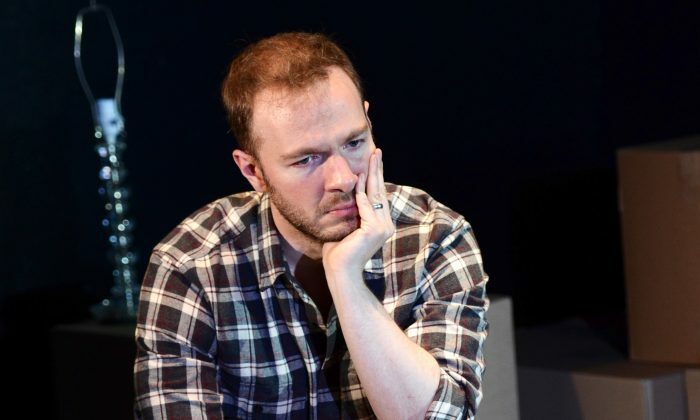 Toni Press-Coffman examines this kind of loss in her powerful drama “Touch,” as presented by Libra Theater Company at 59E59 Theaters. As the story begins, Kyle (Peter McElligott), a man in his mid-20s, is packing up boxes in the apartment he shared with his wife, Zoe. She was quite simply the love of his life. Kyle, who could best be described as a science nerd who grew into an astronomer, became totally smitten with this outgoing, vivacious young woman when he first saw her in high school six years earlier. She made such an impression on him, in fact, that he was late to class for the first time in his life. Zoe and Kyle’s courtship, marriage, and life together is explored in what is basically a lengthy act-one monologue by Kyle. It’s punctuated only by comments from Zoe’s older sister Serena (Emily Batsford) and Bennie (Amadeo Fusca), Kyle’s childhood pal and probably the only close friend the introverted Kyle has ever had. The loss of Zoe, in a seemingly random act, shattered not only Kyle but also everyone else who knew her. All are now struggling to find a way to move forward while trying to deal with what happened. As the play makes clear, everyone deals with grief differently. It is particularly hard on Serena, for example, when Kyle, in an attempt to find his own way through the pain, cuts all ties with Zoe’s family. He immerses himself in his own coping mechanism but closes himself off to others who need his help to deal with their own hurt. Yet the playwright also focuses on how resilient and resourceful the human spirit can be. Kyle experiences this fact when he meets a prostitute (Katrina Lenk) who becomes an essential part of his healing process; and which Bennie and Serena discover when they start to see one other in a different light, now that the initial reason they had for knowing one another is gone. It requires a delicate dance to make a character we never see feel real enough for us to care about, while not hitting us over the head with necessary information. Fortunately, the playwright’s text and McElligott’s delivery are more than up to the task. The stories Kyle tells about Zoe and their time together offer clear insights into who this woman was and how she transformed his life. Most importantly, Zoe is not made out to be a perfect woman by any means. She had a strong streak of jealousy where Kyle was concerned, as well as a dogged amount of stubbornness. Her family found out about the latter when Zoe threatened to never speak to them again if they didn’t accept her marriage to Kyle. The two got married the winter after their high school graduation, with both their families thinking it was much too early in their lives for them to take such a step. Where the show runs into problems is with the character of Kyle. While there’s no denying his feelings for Zoe, without his many references to her that act as a sort of counterbalance, Kyle comes off as unlikable and even self-centered. Any scenes involving him in which Zoe doesn’t figure directly feel like excess baggage. This issue becomes even more apparent when Bennie and Serena are given much more to do in the second act. Their emergence in the storyline threaten to take away from the main focus of the play. Direction by Nathaniel Shaw is rather slow-paced, but it does allow the audience to be carefully drawn into the story. While the ending doesn’t wind up wrapped in a neat little package, it is certainly fitting. Craig Napoliello’s cramped set of Kyle and Zoe’s apartment works nicely, but it might have been better if it were somehow opened up a bit to accommodate some of the later scenes depicted in the play. Problems aside, “Touch” remains a quietly involving piece about the human heart and the ways people respond in times of grief. At the same time, it points out how we have a responsibility to ensure that our own healing does not come at the expense of others trying just as hard to heal.